What Does It Take to Be a Marine Corps Security Guard? One of the biggest reasons soldiers join the U.S. Marines is to take part in an "adventure." Also, military recruits are drawn to the Marines because they want to meet and overcome the challenges, physical and mental, of earning the title "Marine." According to the United States Marine Corps, no other billet in the Marines, or any service, can live up to the importance of Marine Security Guard duty. Marine Security Guards provide security at about 125 U.S. embassies and consulates around the globe. They are primarily responsible for interior security at embassies, usually in the lobby or main entrance, according to the U.S. Marines. Guards are trained to react to terrorist acts, as well as a host of emergencies, such as fires, riots, demonstrations, and evacuations. Must be in the rank of E-2 through E-8. Must be eligible for a Top Secret Security Clearance. Must have one year time on station (waiverable). Must have an ASVAB " GT Score " of 90 or above (waiverable). Those who have a GT score of less than 90 are encouraged to retake the ASVAB. Must have no tattoos visible in uniform. Must meet Marine Corps weight and fitness standards. Must have no record of Nonjudicial Punishment within the last year. Marines in the rank of E-5 and below must be single, with no dependents. However, those Marines who have children but are not the primary caretakers are not immediately disqualified (i.e., paying child support or alimony is not an immediate disqualifier). E-6s and above may have up to four dependents to include spouses. Upon selection, Marines attend the Security Guard School at Quantico, VA. The MSG school conducts five class sessions per year training more than 450 Marines. 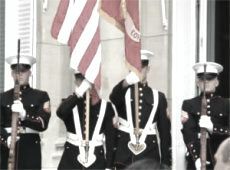 Upon graduation from MSG school, Marines in the rank of E-5 or below are assigned as standard security guards or "‘watch standers." These Marines then serve three separate year-long tours, one of which will likely be a hardship post in a third world country. Marines in the rank of E-6 and above are assigned as detachment commanders and are operationally responsible to the ambassador or appointed delegates. They serve two, 16-month tours and can bring dependents along. Each tour is served in one of nine regions. For more information, or to apply, see your Career Retention Specialist (CRS) and inform him/her that you are interested in becoming a Marine Security Guard. Note: Your command cannot deny your request to MSG duty. They simply make a recommendation. They still have to submit your package through your Career Retention Specialist. HQMC has the only say as to whether you will receive orders. If someone in your command refuses to let you submit a package, make sure you get it in writing, then contact the MSG Security Screening Team at (703) 784 4861.